This project work covers the period since 2006. A lot of progress has been made, but as this is a part-time hobby it does cause delays. Plus I have been building a house for the 3 years 2011-14, so my time has been very limited. 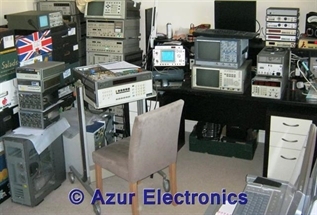 Currently my projects consist of: designing some new products; evaluating and repairing recently purchased test equipment; plus some areas of research where my knowledge is limited. Also there are various other tasks that need some work. A major new challenge for me was to understand what is involved in three areas of electronic measurement: Logic Analysers; Network Analysers; and Spectrum Analysers. I had limited previous experience in some of these areas, so I set myself a very demanding goal, especially in terms of extended frequencies up to microwave. My objective is to acquire the necessary equipment, understand the technology, and to build fully functional test systems up to 18GHz. The results of all this work are explained in Operating Information. Although this project is nearly complete, I do have some outstanding work to finish. One of my new designs requires microprocessor control, implementing this in 74 series logic would be far too convoluted. Therefore I have started work on Microchip PICs (Peripheral Interface Controllers) and C Programming. This is proving to be a BIG learning curve! When I have cracked it, maybe PICs will be included in this website.